Fresh off the boat (or plane) from Haiti in 2000, a Haitian man reunited with his taxi-driver dad in Philly. Desperate to find his 20-year-old son work in a foreign land, he asked a stranger in his cab for any leads. The stranger told him to have his son, Ricardeau Scutt, meet him in front of Saladworks Restaurant the next day. The good Samaritan got Scutt a job as a dishwasher at the restaurant. In between working at Saladworks and taking ESL (English as Second Language) courses, Ricardeau’s overcame the language barrier. Three years later he became general manager of Saladworks and received US citizenship. Last Fall, Saladworks execs secretly went to the Food Network to tape Ricardeau’s managerial skills for a reality competition show he didn’t even know he was on. And he won! 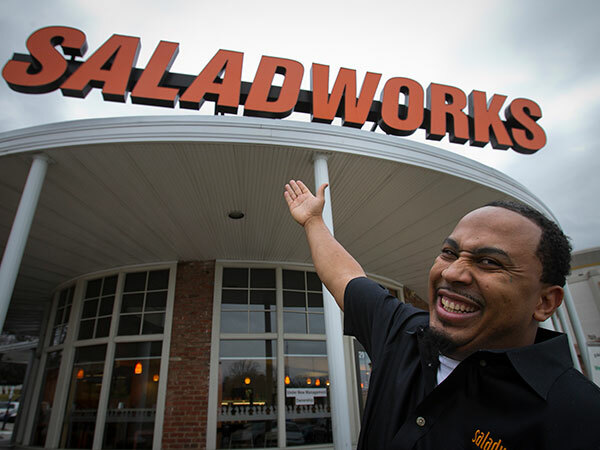 Now he’s the proud franchise owner of a Salad Works restaurant. All because a stranger took time to give him a chance. You never know who could be a blessing to you, even a stranger in disguise. To read more about Ricardeau’s story visit the Philadelphia Daily News.